Tannins are all over the place. They are in the trees, in the roots and most plants. They are in the tea you drink and the leaves and weeds you walk on. Bark tanning is a bit of a mis nomer, although not as much as the term Braintan is, because you don’t need bark to tan your hide, what you need are tannic acids. They can come from bark, or other sources. Sumac leaves (not the poison kind) are an excellent source of tannin, for example. Hardwoods such as Oak are one of the better sources for bark high in tannins, although softer woods can work. Barktanning is not complicated, but like brain tanning, don’t assume that simple means easy. Most barktan operations include liming or lying the hide, then rinsing, to better receive the tannins. The bark is chopped up as fine as possible and boiled to extract the tannins. 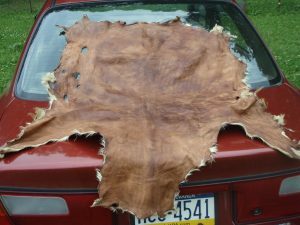 The basic goal is to soak the hide in the tanning solution long enough, or with enough agitation, that the tannins penetrate entirely though the fibers of the hide, to the center, then to apply oils and work the hide, to make the leather flexible and somewhat water resistant. Bark tanning was once a huge industry in the eastern United States. Chrome tan has almost taken over the leather industry and very little true barktan is produced in the country anymore. Some of us would like to change that to some degree and allow people to see the benefits and beauty of all natural barktan again.